Warning: Only attempt this if you are competent to do so! There can be lethal voltages inside the DVD player even when its unplugged. I'm not liable if you damage yourself or your player trying this repair. Read the disclaimer. If your not sure, pay someone else to do it for you. The player will not read any discs. Removing cover confirms that disc is not spinning up, or is struggling to spin up to speed. Laser is presumed to be working ok. The fault is caused by the spindle motor failing. The spindle motor is a Samsung JQ24-315350F. It can be replaced with any suitable 3 volt motor if you cannot locate the original Samsung part. Upon replacing the spindle motor, you may find that the discs are still having trouble spinning up, in which case you need to check R30 (1 Ohm) on the mainboard, as its probably blown. Check for voltage across spindle motor as its trying to spin up. You will probably find that the voltage is only reading around 1 volt or so, that's a good indication that R30 is blown. Note that you can not do this test until you have replaced the spindle motor as the bad motor will skew the readings, and if you disconnect the motor it will read about 4 volts whether R30 is blown or not. Of course a quick check of R30 with an ohm meter will tell you instantly if it's blown or not. It will probably read about 90-100 ohms (in circuit) if it's blown. Important Note: If you find that R30 is blown, you MUST replace the spindle motor. If you do not replace the spindle motor, the replacement resistor you just fitted will probably blow again very soon... Treat them as a pair... 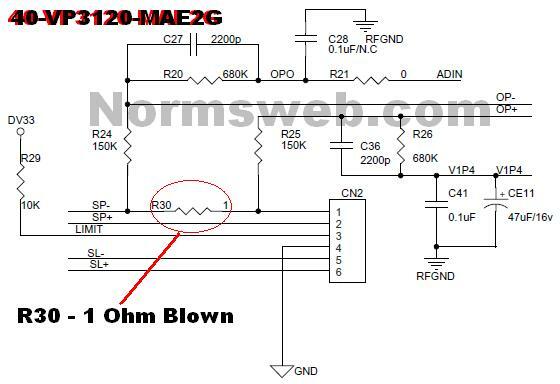 If the resistor is blown you must assume the motor is too, even if it appears to be spinning ok. Replacing the tiny surface mount resistor is hard, but not impossible. You also need a very steady hand, because if you slip the soldering iron you can wipe out several components. 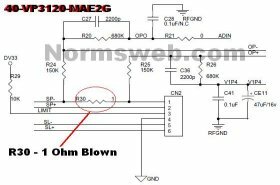 R30 is only 1 Ohm so it can just be bridged right? Wrong! If R30 is bridged the player will play discs, but it will not spin down the discs upon ejecting and your disc will be ejected into the tray still spinning fast, which is not only dangerous, but will damage your discs too. Also if R30 is bridged then the motor controller has no protection. R30 sacrificed itself to save the motor controller IC, and if R30 had not blown then the motor controller IC would have probably blown instead. After the job is done you should be reading 2.5-2.9 volts across the spindle motor and the player should now read all discs perfectly. One thing to note is that the service manual for this player indicates that you should use only lead-free solder and equipment when working with this board, however, I only had normal leaded solder to hand, so I used it and it worked fine.